Filing for Florida child visitation? Establishing a generous and beneficial time sharing arrangement with the children of separated parents is arguably the most important part of any separation, both for the parents, and for the children. Florida child visitation can be established and modified in several ways. Depending on the specific situation of the parents, the children, and the circumstances of the separation, the procedure will vary. Read the information below to determine which court forms are available and how you should file for visitation. In Florida, visitation is ordered within a parenting plan that is filed and accepted by a court. Most parenting plans are agreed upon by both parents, but in some circumstances, the court may order a parenting through mediation. For a more in depth discussion of Florida's Best Interest doctrine as it pertains to Child Custody issues, have a look at our Florida Best Interests Law page. The information contained here is for informational purposes only. We have invested time and effort in verifying and providing the most current information and forms for you to use. All divorces in Florida and any family law proceedings that require the establishment of custody and visitation between parents now require a Parenting Plan. The Florida Courts provide three separate parenting plan forms: Parenting Plan, Long Distance Parenting, and the Safety-Focused Parenting Plan. It's important to remember that these parenting plan forms are not intended to fit all situations. Parents are encouraged to use the parenting plan that most fits their situations and customize it to an agreeable plan that works for both the adults and their children. We have a more complete discussion of Florida's Parenting Plan Forms including information on how to file and the factors the court considers when approving or disapproving of a proposed parenting plan. The Florida child custody and visitation form Supplemental Petition To Modify Parental Responsibility, Visitation or Parenting Plan, Time Sharing Schedule And Other Relief, Form 12-905(a) should be used when you are asking the court to change current court-ordered custody or visitation arrangements. The court can change an order granting shared parental responsibility, including a primary residential responsibility custody order if the judge finds that there has been a substantial change in the circumstances of the parties and the change is in the children's best interests. A current child visitation order may not be modified without a showing of a substantial, material, and unanticipated change in circumstances and a determination that the modification is in the best interests of the children. Modifying an existing Child Custody & Visitation order is generally done by using a Supplemental Petition to Modify Child Visitation, Form 12.905(a). 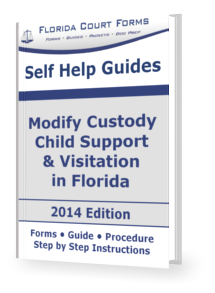 We also have a comprehensive self help guide covering child visitation modifications. See link below. When unmarried parents are involved, paternity must be established before child custody and visitation can be ordered and enforced. There are several ways that paternity can be legally established. The voluntary signing of the child's birth certificate at the hospital is the most common way for the legal establishment of paternity in Florida. Another way to establish paternity is to have the court order scientific paternity testing. This procedure is handled through the Petition to Determine Paternity and for Related Relief (see below). Once Paternity is established (through scientific paternity testing if necessary) then custody, visitation, time-sharing and parental responsibility can be established. Have a look at our Florida Petition to Determine Paternity & Other Relief web-powered instructions page. These pages are very popular with Pro Se filers mostly because of the hyperlinks to the supporting forms and to the applicable Florida statutes. FAMILY LAW FORM 12.905(d), the Supplemental Petition For Temporary Modification Amendment Of Custody For Children Of Custodial Parent Activated, Deployed, Or Temporarily Assigned To Military Service, should be used when a parent seeks a temporary modification of custody because the custodial parent is activated, deployed, or temporarily assigned to military service. This form should be used when a parent seeks a temporary modification of an order establishing custody, visitation, a parenting plan, or time-sharing schedule because the parent is activated, deployed, or temporarily assigned to military service.